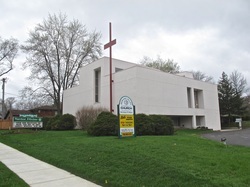 Savior Divine Lutheran Church in Palos Hills is a place to help you develop a personal relationship with Jesus Christ and use your talents to help him bring the abundant life of the kingdom of God to others. Elsie's Food Pantry is open on Thursdays from 3 to 5 PM. The pantry seeks to help people in the church's surrounding communities. Eligibility is based on one's monthly income. Click here for more information. This season will focus on the role of the arts in expressing oneself to God as well as being inspired spiritually through the arts. You may post your ideas on our bulletin board at church. ​"Recognizing the Greatness of Christ"
Thursdays 3 - 5 p.m.
Rev. Martin W. Pauschke, D. Min. Office Hours: Tuesday - Friday 10:00 a.m. - 2:00 p.m.